Donald Trump Cabinet: Who Is Treasury Nominee Steve Mnuchin? : The Two-Way Mnuchin is a hedge fund CEO and longtime Wall Street banker. His involvement in the spike in foreclosures following the housing market's crash could complicate his confirmation. Adviser Steven Mnuchin arrives at Trump Tower in New York on Nov. 17. President-elect Donald Trump has picked his campaign finance chairman, Steve Mnuchin, to be his Treasury secretary. The Wall Street banker spent 17 years at Goldman Sachs, where he was a partner, and is now chief executive of Dune Capital Management, a privately owned hedge fund. 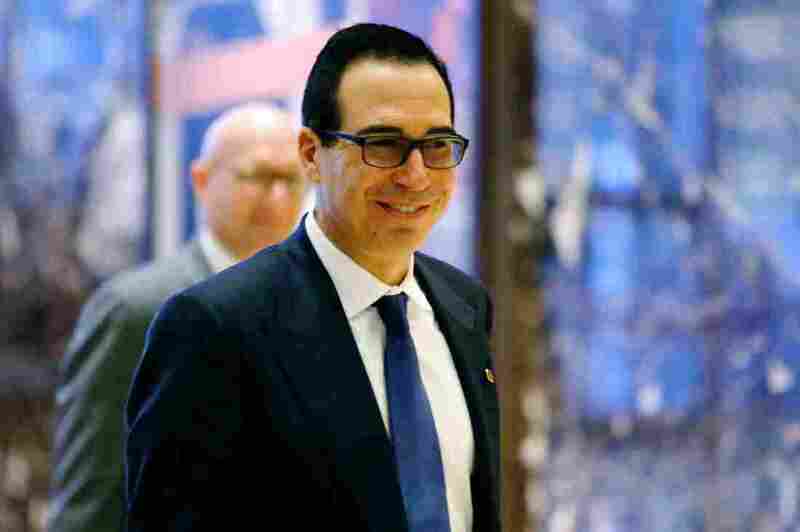 Mnuchin confirmed his selection Wednesday during a joint CNBC interview with billionaire investor Wilbur Ross Jr., who has been tapped for commerce secretary. "Steve Mnuchin is a world-class financier, banker and businessman, and has played a key role in developing our plan to build a dynamic, booming economy that will create millions of jobs," Trump said in a statement. Mnuchin, 53, joined the Trump campaign in April when the organization's fundraising campaign barely existed. He also was involved deeply in developing the president-elect's tax proposals, which could deliver as much as $6 trillion in tax reductions over 10 years, but might also contribute to much larger budget deficits. As Treasury secretary he would take a lead role in developing policies aimed at boosting the country's economic growth. "I understand what needs to be done to fix the economy," Mnuchin said in a statement, adding he would help implement "a bold economic agenda." Over the years, Mnuchin has contributed to both Republican and Democratic candidates, including Hillary Clinton and Barack Obama. He has also been a financier of high-profile movies, including this past summer's Suicide Squad, a big financial success. He also was an executive producer of the movies American Sniper and Mad Max: Fury Road. The banker's involvement in OneWest Bank following the 2008 housing market crash could complicate his confirmation. In 2009, Mnuchin put together a group of billionaire investors, including George Soros and hedge-fund titan John Paulson, that bought failed California-based bank IndyMac, a big mortgage lender. The FDIC agreed to absorb the losses of the bank above a certain threshold. The bank was renamed OneWest Bank, and Mnuchin became its chairman and CEO. The bank developed a reputation during the recession for being quick to foreclose on delinquent homeowners, closing on more than 36,000 households under Mnuchin, according the housing-advocacy group California Reinvestment Coalition. In 2011, protesters went to Mnuchin's Bel Air mansion with a sign that read, "Stop Taking Our Homes."